MRTVI are a band with members from both the United Kingdom and Serbia that has been featured before in this zine and plays an experimental form of black metal and this is a review of their 2017 album "Negative Atonal Dissonance" which will be released on July 30th by Transcending Obscurity Records. Avant garde style soundscpaes start off the album along with some elements of ambient and experimental music while spoken word parts are also used briefly and all of the tracks are very long and epic in length and on the second track the music goes into more of a heavier direction. When the music speeds up a great amount of tremolo picking and blast beats can be heard which also gives the music a more raw feeling while the vocals are mostly grim yet high pitched black metal screams and the riffing also mixes in a great amount of dissonant structures along with the music also bringing in a great mixture of slow, mid paced and fast parts. Both the heavier and experimental sides of the music are mixed together quite a bit throughout the recording and you can also hear all of the musical instruments that are present on the recording and acoustic guitars are also used briefly along with some avant garde style pianos and on the last track the vocals start utilizing a more depressive edge. MRTVI creates another recording that remains true to the experimental style of black metal from previous releases, the production sounds very dark, raw and heavy while the lyrics cover dark and meditative themes. 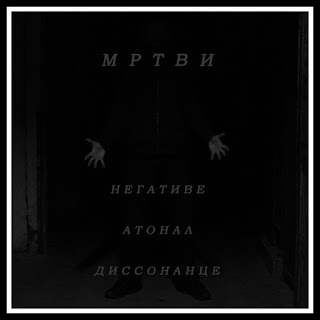 In my opinion this is another great sounding recording from MRTVI and if you are a fan of experimental black metal, you should check out this album. RECOMMENDED TRACK "Negative Atonal Dissonance". 8 out of 10.